What happens when you combine the end of a planned break with a computer's decision to stop working? Apparently an even longer break concluding in the use of someone else's computer with an unfamiliar OS and an unfamiliar browser. Without dwelling too much on the details, I've recently had the ....pleasure to discover this first hand. Thus this is is the first of this week's multiple updates. .... Anyway! Timothy Zahn's latest Star Wars book Choices of One was released not long ago and, being the massive Zahn fan that I am, I eagerly snagged a copy from the book store. However, doing so forced me to come face-to-face with something I knew was coming. I had scene the press releases for the book. I knew it was a victim to the horror that has been plaguing Star Wars books both good and bad since Heir to the Empire hit the shelves twenty years ago: terrible covers. Help! A computer game ate Mara! There a few problems I have with this cover, but, honestly, it's far from the worst cover a Star Wars book has had to bear. There are without a doubt far more terrible than good covers and even more blandly mediocre covers. Instead of wading through the slew of book covers that repel people from Star Wars books, let's look at some of the better art that has graced these books. This list is in no particular order and is restricted to books I own, largely because of the shear number of Star Wars books ad the fact that it's much easier to look through the books I own. 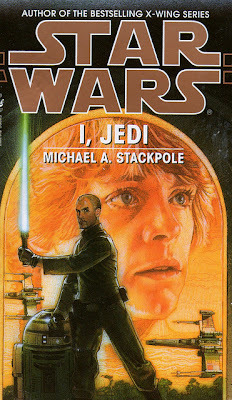 I, Jedi by Michael A. Stackpole, published by Bantam Spectra, 1998. One of the major problems with Star Wars book covers from the '90s is the reliance on stills from the movies. They would often be a hodgepodge of characters painted straight from the stills onto a generic background. If there were any characters on the cover that weren't from the films, they had a flat look due to the lack of photo reference and were often shoved to the Unknown Regions of the cover. This cover does not do that at all. The central figure is Corran Horn, a character first appearing in the X-Wing book series and the viewpoint character of this novel, shown here in disguise as Keiran Halcyon. While there is a close up of Luke's face, it's very clearly in the background. The cover has a sense of cohesion that was rare for Star Wars covers of the day and, most shocking of all, Corran is well-painted. When I think of Corran, I picture this cover. 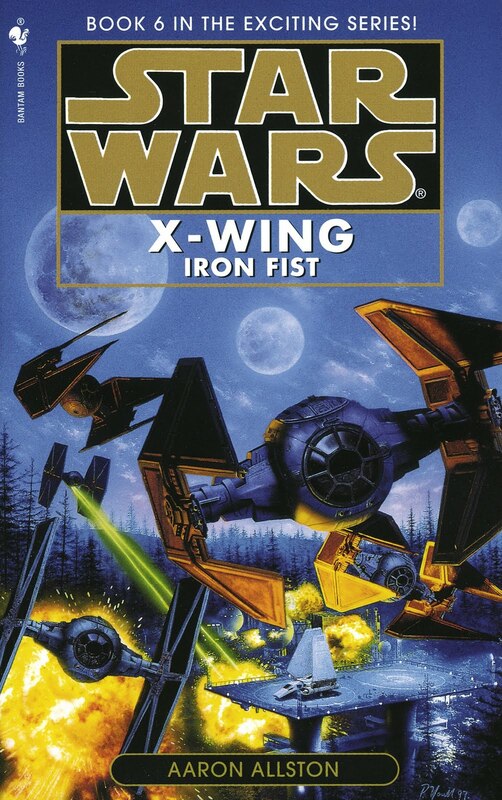 X-Wing: Iron Fist by Aaron Allston, published by Bantam Spectra, 1998. Ah, the X-Wing books, the bastion of light and hope during the time of poorly painted character stills. 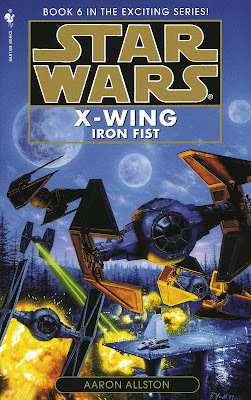 While I, Jedi deviated from other covers of its time by focusing on the original character, the X-Wing books took a different route, choosing instead to shown no characters and to focus on vehicles, most notably snub fighters. Each cover in the series depicts one scene from the books with some difference and each cover each has a sense of both cohesion and drama. As the covers are all excellent and rather similar, I chose Iron Fist to represent the nine-book series because it's my favorite of the covers. 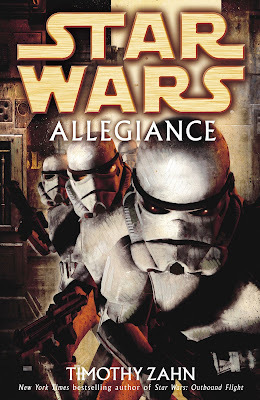 Allegiance by Timothy Zahn, published by Del Rey, 2007. And now for the last of my short list, the real reason I was so disappointed with the cover of Choices of One. Choices of One is the sequel to Allegiance, the cover of which I actually like. While most of Del Rey's Star Wars books carry blandly unmemorable covers featuring heavily photoshopped characters for that mass-produced look, this cover combines CGI with brush strokes (either real or generated) to give the stormtroopers a rough feel. However, this is only effective because they are storm troopers; put someone without armor on this cover and you get another mediocre photoshopped image with added element of it looking like a screenshot from a seven-year-old computer game. 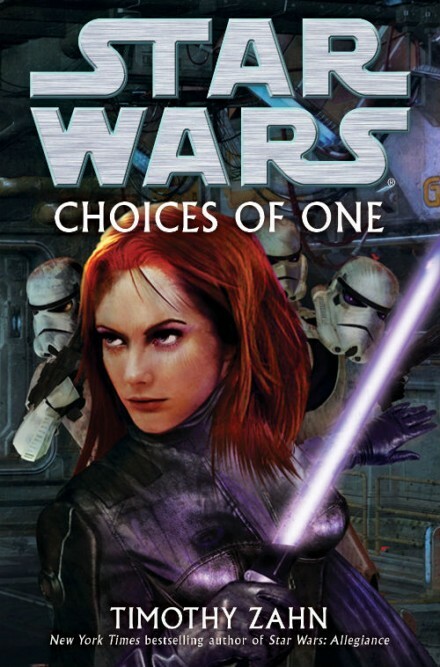 Thus, the Choices of One cover. That is my subjective little list of the top three covers for Star Wars book I own. Please comment and let me know how you agree and/or disagree and what other books you think have good covers. Next time: Ryorin discusses comics and reboots. Again.